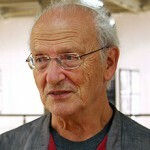 Jean Giraud, better known as Moebius, died yesterday at the age of 73, after he lost a long battle against cancer. 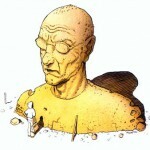 Moebius developed a unique art style, known by many people although not everybody will realize this. When I was a kid, I read his Blueberry comics in the weekly magazine I was subscribed to. 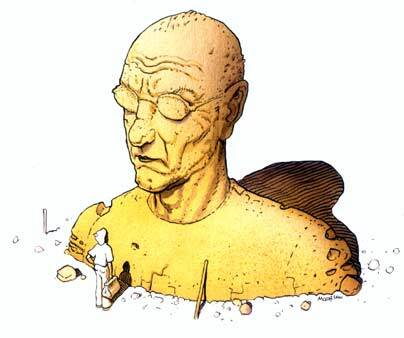 When I grew up and my interest in graphic novels was renewed by the friends I made at university, I discovered the “adult” (as in: not kid-oriented) comics drawn by Moebius and was fascinated by the dark, yet vivid style of these drawings. The frames are explosions of colour – much different from the Blueberry style. Not only did he create many comic strips (graphic novels would be a better description), he contributed story boards and conceptual artwork to several well-known movies like Alien, The Abyss and Tron. His Incal series was the inspiration for the movie The Fifth Element. His drawing style can be characterized as “ligne claire” of which Hergé (the creator of Tintin) was another well-known exponent. However, the atmosphere of the stories these two artists created are near opposites. I felt deep regret when I read that this great contemporary artist passed away. Let’s remember him through his works of art. Posted: 11 March, 2012 in Art, Me. Thanks Eric. Life is keeping us so busy, I had forgotten about Blueberry and Moebius altogether. Sometimes you wished you could still be a kid. I read this the other night. I remember reading Blueberry through the old magazines of PEP that my dad had carefully kept and binded together ..
A shame and as Barnaby said .. takes you back to the days of yore. Rejoice at a death and mourn a birth… common sense really as we will all be there sooner than we think. ! ps I had two bundles of comics when I was a child,one bundle was for swaping with some and the other bundle was for swaping with the rest. ??? In Italy his Blueberry hasn’t hit mainstream, in that field Bonelli’s Tex and Zagor ruled the market: italian childs of the 70’s (including me) grew up with that and the american marvel/dc superheroes. But later on, in the early nineties, I had the chance of reading some its production, discovering that many contemporary artists, in France and outside of his country, got a lot of inspiration from his work. The greatest strenght I found in its artwork come from his visionary attitude and that can’t be reproduced by any of his disciples/clones and will surely be missed. Another genius passed away. I’ve always been particularly fond of “L’Incal”. Guess I’ll read it again soon.